House Speaker Paul Ryan recently released a first draft of the American Health Care Act, the AHCA, which is designed to “repeal and replace” the Affordable Care Act, commonly referred to as Obamacare*. The bill has unleashed widespread debate focusing on the nonpartisan Congressional Budget Office’s finding that the AHCA would add 14 million to the ranks of the uninsured by 2018, a figure that would swell to 24 million by 2026, unwinding the gains in coverage made under Obamacare. The bill’s supporters counter that much of this increase will be by choice, because the bill eliminates Obamacare’s mandate requiring people to pay a penalty if they choose not to buy insurance. Supporters further note that although premiums are likely to be 15% to 20% higher than under Obamacare in the near term—and higher still for older buyers—they would be 10% lower by 2026. Whether the disparate Republican factions in the House and Senate can compromise to pass a bill and send it to the president’s desk, or work with Democrats to create a bipartisan bill, likely will not become clear for several weeks. Transition to value: Payers (insurers, employers, individuals) will compensate health care providers for quality (successful outcomes), not quantity (specific procedures). Consumerism: Consumers will gain bargaining power as they get more information on costs, success rates and other factors to help them make intelligent choices on how to spend their health care dollars. Consolidation: Although federal judges blocked the insurance industry mergers of Aetna-Humana and Anthem-Cigna, the steady drumbeat of consolidations will continue among insurers and providers if they can show that the mergers will benefit consumers through better products and services and not just create higher prices. Transformative innovation: How to get large organizations to change. Health care property markets shrugged off the industry’s disruption and uncertainty, as year-end statistics indicated strong occupier and investor demand coupled with controlled new supply. 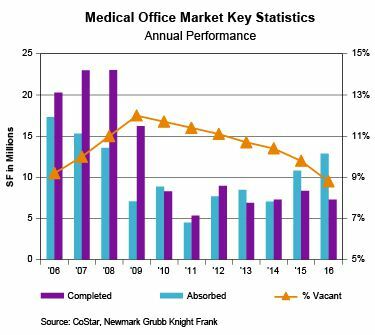 The vacancy rate for medical office buildings (MOBs) ended the year at 8.8%, a 12-year low, while net absorption of 12.9 million square feet was the highest in eight years. The average asking rent rose by 1.2%, ending the year at $23.57/SF full service. Investor demand was strong, as 2016 sales totaled $42.8 billion, just short of the record volume transacted in 2015. Cap rates and pricing reflected sustained demand for MOB assets, although the data revealed a slight softening toward the end of the year. Demographics is destiny, and in the case of the health care industry, the aging of the U.S. population creates overriding demand for products, services—and real estate. Consumerism has not yet reached the disruptive stage for the health care industry that it has for retailers, many of whom are struggling to remain relevant as sales migrate online. There is no equivalent of Amazon among health care providers… yet. Yet there is enough disruption to create obsolescence—locational and functional—in many older health care properties, spurring demand for new properties with state-of-the-art design and locations with easy access to consumers. Look for demand for health care properties to remain solid as the industry continues to evolve. * This article uses “Obamacare” to refer to the Affordable Care Act signed into law in 2010, rather than the commonly used acronym of ACA. The latter is confusingly similar to the acronym of AHCA, which refers to the newly proposed American Health Care Act, intended to replace the ACA/Obamacare.